The residents of Penarrubia, a small, rural municipality in Abra, were not participating in the affairs of their local government units. This was revealed by the residents themselves and confirmed by many barangay officials. Although the people were interested in engaging with their local government, they did not know how. Barangay officials, on the other hand, lacked the capacity to partner with their people. and monitoring and evaluating the implementation of national and local development programs and projects. CCAGG conducted “Trainors’ Trainings” on Participatory Planning, Participatory Budgeting and Local Government Unit (LGU) Monitoring for the 46 officers and members of the Young Concerned Citizens of Abra for Good Governance (YCCAGG), to capacitate them to support Barangay officers and citizens in their engagements. Residents of each barangay were assisted by these officers to create acreddited community-based organizations that could be considered for membership in the Barangay Development Council, which is tasked with preparing the Barangay Development Plan. The new officers and members of the newly formed organizations then attended a one-day training on LGU monitoring. Together, trained citizens and barangay officials prepared Barangay Development Plans, proposing projects and programs taking into consideration the status and needs of the barangay as revealed by public opinion data. CSOs also produced monitoring reports, held dialogues with government officials, and provided recommendations to better serve the community. As a result of the scommunity-basede community based organizations were created, accredited and inducted into Barangay Development Councils. They collected data on the needs of their community and actively participated in meetings to form Barangay Development Plans. As a result, community participation now exists, as mandated by law, in the nine barangays of Penarrubia. The work of the YCCAGG will continue for years to come. A local school, has taken the effort on as one of their community extension or outreach activities. 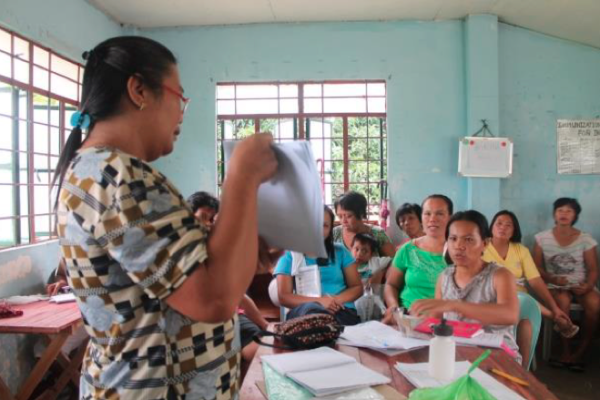 Two of the barangays that participated in the sub-project – Dumayco and Namarabar – will as “models for participatory planning and budgeting” for the program. Meeting with local officials and leaders directly is necessary for smooth coordination of citizen engagement activities. It’s easier to work with local officials who have the political to engage with the public, but persistence and public pressure can encourage even reluctant officials to participate in trainings on citizen engagement. Local officials and residents participating in trainings together end up good partners in governance. A sustained commitment to and knowledge of planning and budgeting, for both government officials and citizens, are necessary to make participatory planning and budgeting work.